Sky Birds of Prey is a family run display team, with over 20 years of Falconry experience, based in the Heart of Kent. We offer many different activities all involving our extensive array of Birds, many of which are native to the British Isles. Being fully mobile, we are able to provide displays (both static and flying) at the location of your choice. We cover many different types of events such as School Visits, Fetes and Country Shows. Birthday and Anniversary parties are also popular. 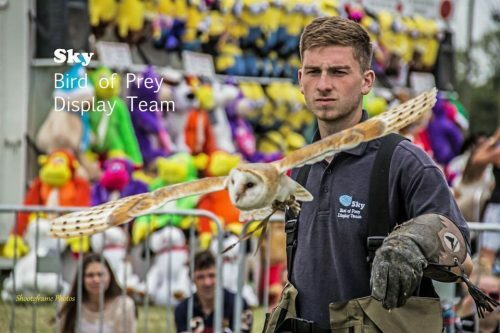 Whatever the occasion and whatever the size, Sky Birds of Prey can tailor make the display to suit you. We also specialise in Experience Days, information on these can be found by clicking the link. These make great gifts for any age group and provide a great day to remember! Fantastic Photography evening. – I have been twice now and absolutely love these workshops, Ryan and his team are great handlers and very knowledgeable. The birds are beautiful and a delight to see and photograph. Capturing birds like these in flight is not easy but great fun and satisfying when you manage to get a sharp shot! The best Photography Experience I’ve been too!!!! – An absolutely amazing day, my first experience of a photo shoot the staff were really friendly and helpful and did all they could to ensure you got the best pictures of the birds, the scenery and backdrops for pictures is really well suited to the subject I thoroughly enjoyed it and would recommend a visit, I am looking forward to the next time. Thank you all for making my day a memorable one. Great afternoon – Really enjoyed my bird of prey photography experience today! Absolutely recommend! One of our best experiences. – This was one of the best experiences we’ve ever had. We went for the owl experience today (14 October 2017) and were able to fly 4 different owls – each had their own character! It was amazing to be so close to them and hands on right from the start. Ryan is very knowledgeable and clearly extremely passionate about what he does. We would seriously recommend Sky Birds of Prey to anyone! 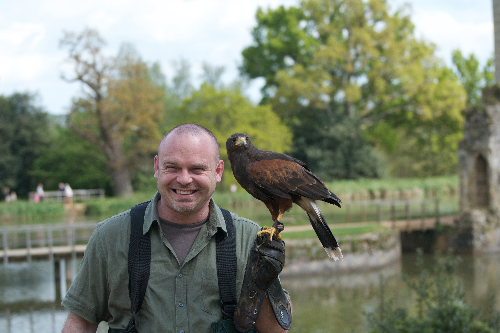 Beautiful birds – The birds of prey experience is great fun, we really enjoyed it. The guy was very knowledgeable, the birds were amazing and the surroundings are nice too. Amazing day out – Myself and my fiancée treated ourselves to an ‘Owl Experience’ as a joint Christmas present. We were welcomed by a thoroughly enthusiastic and friendly young man by the name of Ryan. He explained what to expect from the day over a coffee. We walked to the field where the birds are flown. Each bird was introduced to us, a detailed run down of the species and then the opportunity to fly the birds in turn. There were 4 different owls on our visit and each was a very different character. Our experience was a couple of hours introduction which was incredible value, very informative and thoroughly enjoyable. Will definitely return and quite likely opt for a longer experience having had our interest gained with this. The way the birds are cared for and the hands on approach with encouragement to get involved the whole way through really did make this a great day. Walk with The Hawks – What a lovely , enjoyable afternoon walking with the Hawks. Paul is so knowledgable, we learnt a lot while have amazing fun. The birds are so well looked after and just stunning. Amazing day with my grown-up kids!!! – I visited Sky Birds of Prey for a three hour experience with owls, a hawk and falcons, with my two grown up children as a surprise for them. We absolutely loved it and we were all bowled over by the knowledge, dedication and passion that Ryan has for the birds and for giving everyone a good time. We learned such a lot, and were constantly surprised and delighted by the birds’ appearance, plumage and characters (all different) and their hunting instincts. We worked first with owls of different sizes including Tawny, Barn and whopping Indian Eagle/long eared owls, then a Lanner falcon and Harris hawk, and finally watched Ryan work with his younger Peregrine falcons, with their speeds of over 100mph, totally amazing. The whole experience was something different and stimulating and Ryan was happy to answer our constant questions with patience and knowledge. Incredible Experience – What an amazing experience for my daughter who is owl mad! Can’t fault the day at all! Great fun flying the owls and a very personal experience for my 10 year old. She learnt a lot through a great handler who was passionate and informative about the birds! The little tawny owl won my heart!